TravelVision: Are You On The Social Media Bandwagon? 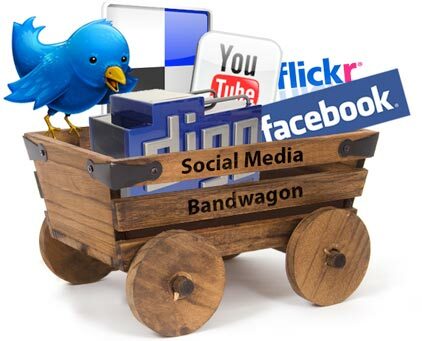 Are You On The Social Media Bandwagon? It's not enough to jump on to social media networking, you have to own it! Marketing your business successfully through social media takes real participation. It's extremely important not to just do it because everyone else is. Your intent should be to position yourself as an influencer. It doesn't matter if you're introducing a new business or breathing new life into an established business. To be successful in today's market you have to be credible, relevant or beneficial. More important, your efforts should relate to your equally credible product or service. An influencer is defined as someone who through knowledge, ability or position effects someone else's thought process. Does that mean you can't comment or post if you've nothing remarkable or earth shattering to say? Absolutely not, but at the very least it should be relevant and support your desire to influence. It's also very easy to get caught up in the chatter, but if it is not relevant to your business don't talk about it. Once you've put it out there it's very hard to retract your words. Worse yet, it can spin out of control. Having your post or video go viral can be really great or really, really bad. Make it a rule not to post useless comments or hearsay. In other words, if Mitt Romney's Nascar connections or Snooki's possible pregnancy or what you ate for breakfast are not related to your specific business don't mention them or respond to others who do. Listen to your guests. Everyday they tell you what they like, don't like and want. Remember, influencers were first good listeners. Also, resist the temptation to comment on a negative, cheap or downright awful guests or to respond negatively to their comments. It is not that one disgruntled or awful guest you have to seriously worry about. What matters in social media are those guests and potential guests who are gauging and responding to your actions and reactions. So rather than reacting badly, respond quickly and professionally using diplomacy, otherwise social media may brand you, but not in a good way. I've been dabbling in social media for a little while, I guess it's time to be more proactive. Social media is presenting different ideas for different fields. Such types of blogs are so good and preferable for the essay writing service work. I am sure this is a perfect blog for the readers and all the writers also who are good in blogging. how to get free psn money no surveys most of them using this website.